Zwingli: Hercules and Socrates are Redeemed and in Heaven? The Catholic Church recognizes in other religions that search, among shadows and images, for the God who is unknown yet near since he gives life and breath and all things and wants all men to be saved. Thus, the Church considers all goodness and truth found in these religions as "a preparation for the Gospel and given by him who enlightens all men that they may at length have life"(843). The harmony of these statements has been so construed that one defender of Rome, Jimmy Akin of Catholic Answers, goes as far as saying even some atheists may even have a positive eternal fate: "It’s also possible for a person to die in God’s friendship even if the person didn’t consciously know God during life." I believe, then, that the souls of the faithful fly to heaven as soon as they leave the body, come into the presence of God, and rejoice forever. Here, most pious King, if you govern the state entrusted to you by God as David, Hezekiah, and Josiah did, you may hope to see first God Himself in His very substance, in His nature and with all His endowments and powers, and to enjoy all these, not sparingly but in full measure, not with the cloying effect that generally accompanies satiety, but with that agreeable completeness which involves no surfeiting, just as the rivers, that flow unceasingly into the sea and flow back through the depths of the earth, bring no loathing to mankind, but rather gain and joy, ever watering, gladdening and fostering new germs of life. The good which we shall enjoy is infinite and the infinite cannot be exhausted; therefore no one can become surfeited with it, for it is ever now and yet the same. Then you may hope to see the whole company and assemblage of all the saints, the wise, the faithful, brave, and good who have lived since the world began. Here you will see the two Adams, the redeemed and the redeemer, Abel, Enoch, Noah, Abraham, Isaac, Jacob, Judah, Moses, Joshua, Gideon, Samuel, Phineas, Elijah, Elisha, Isaiah, and the Virgin Mother of God of whom he prophesied, David, Hezekiah, Josiah, the Baptist, Peter, Paul; here too, Hercules, Theseus, Socrates, Aristides, Antigonus, Numa, Camillus, the Catos and Scipios; here Louis the Pious, and your predecessors, the Louis, Philips, Pepins, and all your ancestors who have gone hence in faith. In short there has not been a good man and will not be a holy heart or faithful soul from the beginning of the world to the end thereof that you will not see in heaven with God. And what can be imagined more glad, what more delightful, what, finally, more honorable than such a sight? To what can all our souls more justly bend all their strength than to the attainment of such a life? And may meantime the dreaming Catabaptists deservedly sleep in the regions below a sleep from which they will never wake. Their error comes from the fact that they do not know that with the Hebrews the word for sleeping is used for the word for dying, as is more frequently the case with Paul than there is any need of demonstrating at present. Did you catch some of those who Zwingli says "fly to heaven as soon as they leave the body, come into the presence of God, and rejoice forever"? "Hercules, Theseus, Socrates, Aristides, Antigonus, Numa, Camillus, the Catos and Scipios..." Zwingli says, "there has not been a good man and will not be a holy heart or faithful soul from the beginning of the world to the end thereof that you will not see in heaven with God." [A]fter Zwingli’s death a book came out which he is supposed to have written shortly before his death. It was entitled Exposition of the Christian Faith to the Christian King, etc., and was supposed to be better than all his previous books. That it had to be Zwingli’s was evident from his wild, confused language and from his previously held opinion [about the Lord’s Supper]. I have become very frightened about that book, not on my account but on his account. For, because he was able to write this after our agreement at Marburg, it is certain that in every respect he dealt with us with an insincere heart and tongue at Marburg. Therefore I had to despair (as I still must) of the salvation of his soul, if he died with such a disposition, regardless of the fact that his disciples and successors made him out to be a saint and martyr. O Lord God, this man a saint and martyr! In this book he not only remains an enemy of the holy sacrament but also becomes a full-blown heathen. This is the marvelous improvement for which I had hoped. You can see what I mean: In somewhat different words he addresses the previously mentioned king thus: “There you will see in the same fellowship all holy, godly, wise, brave, honorable people, the redeemed and the Redeemer, Adam, Abel, Enoch, Noah, Abraham, Isaac, Jacob, Judah, Moses, Joshua, Gideon, Samuel, Phinehas, Elijah, Elisha, also Isaiah and the Virgin Mother of God of whom he prophesied, David, Hezekiah, Josiah, the Baptist, Peter, and Paul; Hercules, Theseus, Socrates, Aristides, Antigonus, Numa, Camillus, the Catos and Scipios and all your ancestors who have departed in the faith,” etc. This is written in his book which (as has been said) is supposed to be his most excellent and best book, produced just before his death. Tell me, any one of you who wants to be a Christian, what need is there of baptism, the sacrament, Christ, the gospel, or the prophets and Holy Scripture if such godless heathen, Socrates, Aristides, yes, the cruel Numa, who was the first to instigate every kind of idolatry at Rome by the devil’s revelation, as St. Augustine writes in the City of God, and Scipio the Epicurean, are saved and sanctified along with the patriarchs, prophets, and apostles in heaven, even though they knew nothing about God, Scripture, the gospel, Christ, baptism, the sacrament, or the Christian faith? What can such an author, preacher, and teacher believe about the Christian faith except that it is no better than any other faith and that everyone can be saved by his own faith, even an idolater and an Epicurean like Numa and Scipio? (LW 38:289-291). Luther did Not Know What an Indulgence Was? 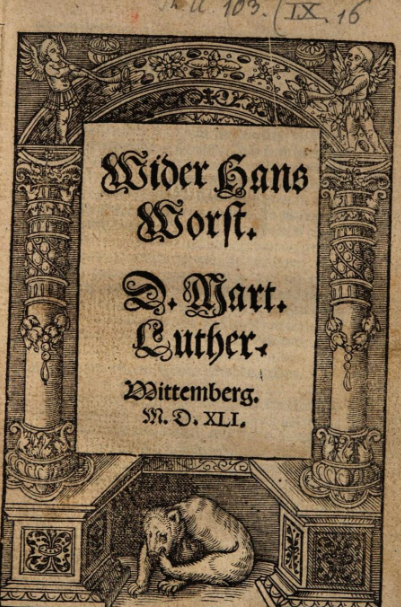 Here's one from an online discussion forum in which a defender of Rome argued: "Luther admitted later in his life that he actually didn't even know what an indulgence was" when the indulgence controversy erupted in 1517. This assertion was shortly followed by this comment directed towards me: "Maybe our resident Genevan cyber defender can come in and white wash it for you guys." The straightforward argument appears to be that at the time of the indulgence controversy, Luther didn't know what an indulgence proper was: "He started his revolution on an abuse of something he later admitted he knew nothing about" (link). A source document to prove this claim from Luther was also provided (see below). This same text can be found in WA 51:539. This text has been translated into English: Against Hanswurst (LW 41:179-256). The quote is on pages 231-232. This treatise was written towards the end of Luther's life. In the section under scrutiny, Luther reflects back on the beginning of the indulgence controversy. It happened, in the year 1517, that a preaching monk called John Tetzel, a great ranter, made his appearance. He had previously been rescued in Innsbruck by Duke Frederick from a sack—for Maximilian had condemned him to be drowned in the Inn (presumably on account of his great virtue)—and Duke Frederick reminded him of it when he began to slander us Wittenbergers; he also freely admitted it himself. This same Tetzel now went around with indulgences, selling grace for money as dearly or as cheaply as he could, to the best of his ability. At that time I was a preacher here in the monastery, and a fledgling doctor fervent and enthusiastic for Holy Scripture. 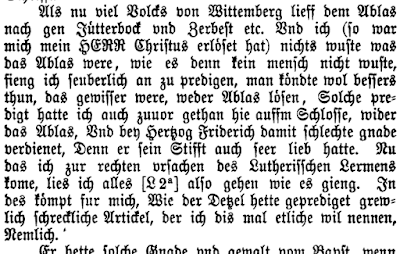 Now when many people from Wittenberg went to Jütterbock and Zerbst for indulgences, and I (as truly as my Lord Christ redeemed me) did not know what the indulgences were, as in fact no one knew, I began to preach very gently that one could probably do something better and more reliable than acquiring indulgences. (86) I had also preached before in the same way against indulgences at the castle and had thus gained the disfavor of Duke Frederick because he was very fond of his religious foundation. Now I—to point out the true cause of the Lutheran rumpus—let everything take its course. (86) See, for example, a sermon Luther preached on February 24, 1517. LW 51, 26–-31. See also two Lenten sermons he preached in March, 1518. LW 51, 35-–49. So my theses against Tetzel’s articles, which you can now see in print, were published. They went throughout the whole of Germany in a fortnight, for the whole world complained about indulgences, and particularly about Tetzel’s articles. And because all the bishops and doctors were silent and no one wanted to bell the cat (for the masters of heresy, the preaching order, had instilled fear into the whole world with the threat of fire, and Tetzel had bullied a number of priests who had grumbled against his impudent preaching), Luther became famous as a doctor, for at last someone had stood up to fight. I did not want the fame, because (as I have said) I did not myself know what the indulgences were, and the song might prove too high for my voice (LW 41:234; WA 51:541; Halle, 52). (34): WA 3. 416, 27f. ; 424, 22f. ; gloss Ps. 68; approx. autumn 1514. The third is now the prevalence of the lukewarm and the evil [peace and security]. For surfeit now reigns to such an extent that there is much worship of God everywhere, but it is only going through the motions, without love and spirit, and there are very few with any fervor. And all this happens because we think we are something and are doing enough. Consequently we try nothing, and we hold to no strong emotion, and we do much to ease the way to heaven, by means of indulgences, by means of easy doctrines, feeling that one sigh is enough (LW 10:351). 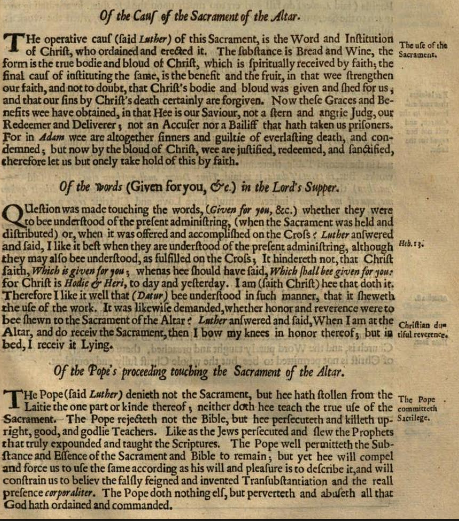 The ambiguous form of words, 'I did not know what the indulgences were...' cannot, of course, mean, 'I did not know what indulgences were', and must therefore mean that Luther was in ignorance about this particular indulgence, itself a slightly implausible claim, given the extraordinary publicity surrounding and running ahead of Friar Tetzel. 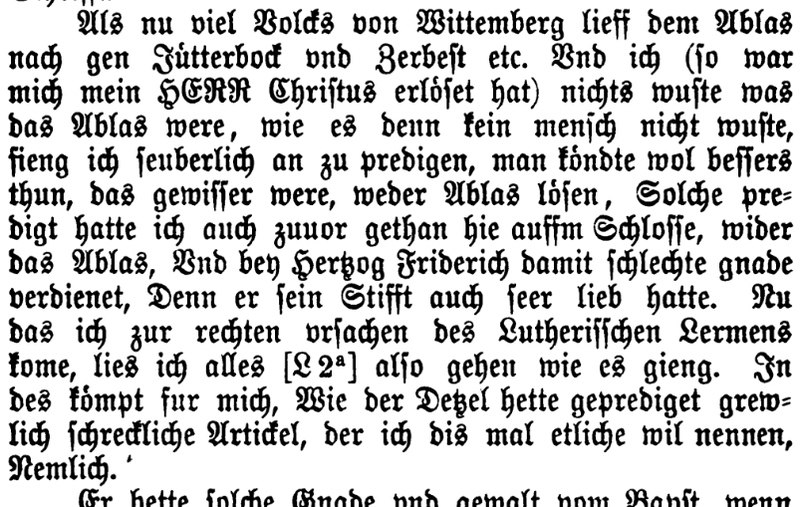 Mullet goes on to say that Luther's claim to not knowing the particular nature of Tetzel's indulgences is "implausible" on account of Tetzel's "extraordinary publicity." At least this author makes a rational historical criticism rather than the myopic contextless literalism employed by the discussion forum Roman Catholic. 178; 181; 182; 185; 186; 188; 190; 191; 192; 193; 194; 195; 196; 197; 198; 199; 200; 201; 203; 204; 205; 208; 209; 212; 213; 214; 215; 216; 217; 218; 219; 220; 221; 222; 223; 224; 225; 228; 231; 233; 242; 260; 261. The ultimate argument this defender of Rome appears to be making is that Luther's use of indulgences in the 95 Theses was "merely a convenient excuse to start his own revolt." His Luther is not an honest monk confronting the rampant abuses involved with indulgences. Rather, his Luther was already a deviant predisposed to revolt and simply needed a means to revolt. It does not necessarily follow that the indulgences mentioned in the 95 Theses were simply a means to revolt because Luther knew nothing or something about indulgences. He states, "Indulgences and their abuse were simply a convenient catalyst to begin his revolt. One need merely look at his what is glaringly absent in his Disputatio pro declaratione virtutis indulgentiarum, as many of what would become the core tenets of his own religious system were not yet crystallized." This use of "Disputatio pro declaratione virtutis indulgentiarum" also does not necessarily follow. Simply because something might be "glaringly absent" does not necessarily mean Luther was plotting to be a revolutionary and simply used indulgences as a means to revolt. I point this out to demonstrate on a presuppositional level, this defender of Rome's Luther appears to be his own concoction. He begins with a deviant man predisposed to revolt and then sifts Luther's writings to fill in what's needed. Luther Privately Admitted He Was Wrong About the Lord's Supper? On a discussion board I frequent someone mentioned "a myth which survived for centuries that Luther privately admitted he was wrong about the Supper but didn't want to admit it publicly because people might doubt his other doctrines," and further that "Schaff, a Reformed historian and polemicist, found it necessary or desirable to mention the myth and refute it in the nineteenth century." (1) “Der Sache vom Abendmahl ist viel zu viel gethan." (2) Hardenberg, a Reformed minister at Bremen (d. 1574), reported such a conversation as coming from the lips of his friend Melanchthon; but Melanchthon nowhere alludes to it. Stahelin (John Calvin, I. 228 sq.) accepts, Kostlin (M.L., II. 627) rejects the report, as resting on some misunderstanding. So also C. Bertheau in the article “Hardenberg” in Herzog’, V. 596 sq. Comp. 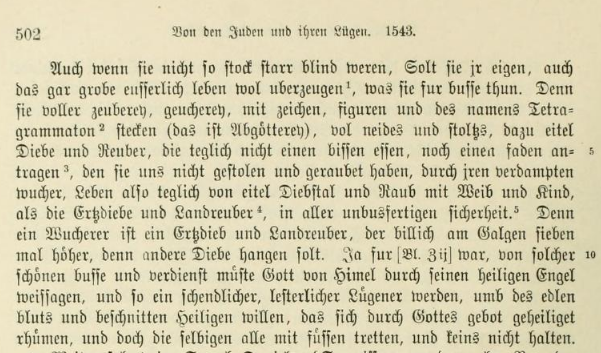 Diestelmann, Die letzte Unterredung Luthers mit Melanchthon uber den Abendmahlsstreit, Gottingen, 1874; Kostlin’s review of Diestelmann, in the “Studien und Kritiken," 1876, p. 385 sqq. ; and Walte in the “Jahrb. fur prot. Theol.," 1883. It is a pity that the story cannot be sufficiently authenticated, for it certainly expresses what ought to have been Luther’s last confession on the subject. DID LUTHER CHANGE HIS VIEW? Already during Luther's lifetime the rumor was circulated that he had after all abandoned his former view in regard to the Lord's Supper. This caused him to publish one more declaration on the subject in 1544. Besides it was no secret to him that his great associate Melanchthon, with a dangerous yearning for peace which must have been hollow and transient (Krauth), had left the position which he had so clearly expressed in the Augsburg Confession of 1530. Moreover, Luther to his greatest indignation heard that one of his former students and housemates, Dévay, had smuggled the Reformed doctrine under his (Luther's) name into Hungary. These and similar provocations caused him to write this last declaration on the subject in the sharpest possible manner. In this Short Confession he does not argue; he simply reaffirms in the strongest possible terms his faith in the real presence; he also expresses his total and final separation from the Sacramentarians and their doctrine. Standing on the brink of the grave and in view of the judgment-seat, he solemnly condemns all enemies of the sacrament wherever they are. (Schaff). Still before a quarter of a century had passed the rumor again spread that Luther shortly before his death regretted the position he had taken against the Swiss. Hardenberg, a Reformed minister at Bremen, declared under oath that he had heard from the lips of Melanchthon that Luther had requested Melanchthon to come to him, and had then said: Dear Philip, I confess that the matter of the Lord's Supper has been overdone.DerSache vom Abendmahl ist viel zu wicl gethan. And that on being asked to correct the evil he replied: I often thought of it; but then people might lose confidence in my whole doctrine. I leave the matter in the hands of the Lord. Do what you can after my death. Melanchthon never quotes such words in his writings or letters. Are they historical or not? Schaff very reluctantly rejects the correctness of the report, but adds in a foot-note: It is a pity that this story cannot be sufficiently authenticated, for it certainly expresses what ought to have been Luther's last confession on the subject. Several books and many articles were written on this question. The latest investigation is by Prof. Hausleiter, of Greifswald, in the Neue Kirchliche Zeitschrift, Vol. 1899. 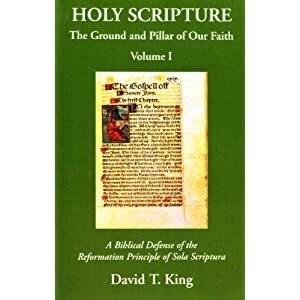 He proves (as we think beyond doubt) by unearthing new and so far unknown material that the words, at least in substance, came from Luther and Melanchthon, but referred to an entirely different subject. 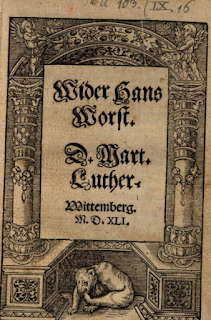 He proves that already during Luther's life-time the publication of Luther's collected writings was commenced (the Wittenberg Edition) though the printing of the first volume was not completed until two years after his death. In this first volume also the writings concerning the Sacrament were to be contained. Bucer, who now sided with Luther, desired that the scorching words of Luther referring to him and his miserable tactics (described in Article I.) should be omitted. He did not venture to ask this of Luther himself. but urged his request through the Elector and Melanchthon. Luther at first refused point blank, but a few days before leaving Wittenberg for Eisleben, where he died, consented to permit the change. The words quoted by Hardenberg referred to this omission. For this reason the words were omitted in the first Wittenberg edition. We have clear and very positive declarations of Luther made shortly before his death showing that he was far from abandoning or modifying his conviction in regard to the Lord's Supper. He remained steadfast in his confession unto the end. The testimony of Dr. Alesius Scotus, a professor at Leipzig, and the friend of Luther and Melancthon, is well known, and has been often printed. In his answer to Ruard Tapper's defence of the Louvain articles, he says, "They do as if they were ignorant of what Luther said to Philip, ere he set out for his native province, where he died. Philip related it to many, and in various ways, that Luther, unasked, said, 'I own that too much has been done respecting the sacrament:' and when Philip answered, 'Let us then, my good doctor, for the sake of the churches, publish some pacific treatise, in which we may clearly unfold our views'—Luther replied, 'My Philip, I have thought anxiously on this matter; but as I might throw suspicion upon the whole doctrine, I will only commend it to the good care of God. Do you do something after my death.' These words were written down from Melancthon's own mouth." It was the wish of the latter to mention the subject in his testament, but he died too soon. The witness of Dr. Alesius, who had the account from Melancthon himself, is therefore valuable. It seems certain, that as Zwingli had a deeper insight into the sacrament in the latter years of his life, Luther also, a year before his death, was of one faith and of one mind with Calvin. He regarded him as a brother, and viewed his doctrine as fitted to restore union to the distracted church. And as Luther inclined to Calvin, so did Calvin to Luther. He twice declared his assent to the Augsburg Confession, and stated that, in his opinion, the formulary of the Zurich Union contained whatever was found in the Confession. Lutheran Satire strikes again ! Luther Exposing the Myth says their stated purpose is to show that "from Luther’s own words we shall see him for what he really was, that is a rebellious apostate, who abandoned the faith and led many into apostasy from God under the guise of “reformation” in order to follow his perverse inclinations." With these quotes, they attempt to show while Christ taught "You shall love your neighbor as yourself," Luther held the opposite in regard to the Jews. It will be found, at close inspection, that Luther's laws are much more strict, or at least as severe, as those of Hitler. Very often he repeated his order, “The Jews have to be expelled from our country.” Or he gave the Christian advice. “The Jews deserve to be hanged on gallows seven times higher than ordinary thieves” (W53, 502). Von den Juden und ihren Lügen was a response to a letter from Count Schlick of Moravia. The Count had sent Luther a Jewish apologetic pamphlet allegedly containing a Jewish attack against Jesus, the Virgin Mary, and Christian exegesis of the Old Testament. The Count asked Luther to refute it. Unfortunately, this letter and attack have been lost, so we are unaware of the exact tone of argument Luther was responding to. Whatever was in that Jewish writing, Luther erupted in vicious polemic, attacking not only through theology, but also in antagonistic ad hominem as well. 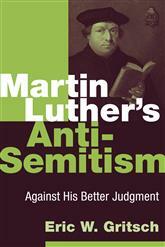 Luther moved from his earlier writings of attacking Jewish theology to attacking Jewish people. This treatise has been translated into English in LW 47. The quote can be found at LW 47:241-242. This treatise was translated "only to make available the necessary documents for scholarly study of this aspect of Luther's thought" and its translation "is in no way intended as an endorsement of the distorted view of the Jewish faith and practice or the defamation of the Jewish people which this treatise contains" (LW 47:123). If they were not so stone-blind, their own vile external life would indeed convince them of the true nature of their penitence. For it abounds with witchcraft, conjuring signs, figures, and the tetragrammaton of the name, that is, with idolatry, envy, and conceit. Moreover, they are nothing but thieves and robbers who daily eat no morsel and wear no thread of clothing which they have not stolen and pilfered from us by means of their accursed usury. Thus they live from day to day, together with wife and child, by theft and robbery, as arch-thieves and robbers, in the most impenitent security. For a usurer is an arch-thief and a robber who should rightly be hanged on the gallows seven times higher than other thieves. Indeed, God should prophesy about such beautiful penitence and merit from heaven through his holy angel and become a flagrant, blasphemous liar for the sake of the noble blood and circumcised saints who boast of being hallowed by God’s commandments, although they trample all of them under foot and do not keep one of them [LW 47:241-242]. The practice of usury, in the simple sense of the taking of interest on loans (without any connotation of exorbitant rates), is prohibited in such texts as Exod. 22:25, Lev. 25:35 ff., and Deut. 23:19 f., but only with respect to fellow Israelites. The Deuteronomy text is the most explicit with regard to dealings with others: “To a foreigner you may lend upon interest, but to your brother you shall not lend upon interest” (23:20). The practice of usury was strictly forbidden to Christians by the medieval church, but permitted to Jews. They prohibition began to break down during the Reformation period; Luther himself, however, steadfastly maintained the medieval position [LW 47: 169 (footnote 31)]. In a sermon of 1519, Luther joined the discussion on the use and abuse of money-lending, linked to the practice of "usury." Jews were accused of usury. But the charge was linked to an arrangement between Christian princes and Jewish merchants: the Christian political authorities permitted Jews to charge interest rates, but also made the Jews pay considerable sums for protection. It was a form of pawn-broking or of retail trade. Jewish traders offered discount prices, and Christian artisans complained about being cheated, using popular anti-Semitic rhetoric. Roman Catholic Canon Law prohibited usury, referring to Luke 6:35 ("lend, expecting nothing in return") [Eric Gritsch, Martin Luther's Anti-Semitism, Against His Better Judgment (Grand Rapids: Eermans, 2012), p. 57]. 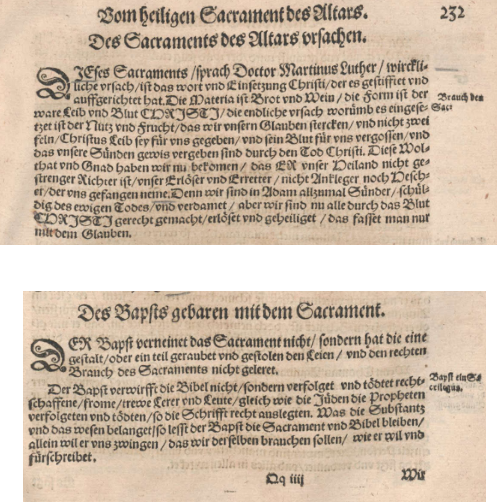 In Luther studies there have been a number of researchers who conclude Luther's later anti-Jewish tracts were written from a position different than current anti-semitism. Luther was born into a society that was anti-Judaic, but it was not the current anti-Judaic type of society that bases it racism on biological factors. Luther had no objections to integrating converted Jews into Christian society. He had nothing against Jews as “Jews.” He had something against their religion because he believed it denied and blasphemed Christ. If one frames the issues with these two categories (anti-semitism, anti-Judaic), Luther was not Anti-semitic. The contemporary use of the word "anti-semitism" though does not typically consider its distinction from anti-Judaism. The word now has a more broad meaning including anti-Judaism. The current debate centers around whether the evolved use of the term is a significant step towards describing previous history or if it's setting up an anachronistic standard for evaluating previous history [see my entry here in regard to Eric Gritsch]. As I've looked at this issue from time to time, I'm beginning to think more along the lines of evaluating Luther with the current understanding of the word anti-semitism. Despite the slander against the nation of Germany (as if there is something intrinsically wrong with them), it's simply illogical to think Luther invented Jewish oppression and that the church collectively didn't play it's part in creating the anti-Judaic culture Luther lived in. If Luther's spiritual son was Hitler, whose spiritual son is Luther? Nope, many of Rome's cyber-defenders won't touch that one. The story of Luther's negativity towards the Jews is really to tell the story of medieval Christianity and medieval society's negativity towards the Jews.